What "surviving versus thriving" really means. There’s a tender moment midway through A Quiet Place when the Abbott family sits down for a totally silent family dinner, and they wordlessly hold hands to “say” grace before eating out of lettuce leaves with no utensils. If they used forks and knives — or even spoke above a barely-audible whisper — horrible monsters would rush into their home and rip them all to pieces. The scene forges dramatic tension while also reminding us that a family doesn’t stop being a family just because it’s the end of the world. It’s everything A Quiet Place does so well distilled into a single scene. “They are turning to some kind of higher power to protect them because they’re living in total torment,” Emily Blunt said at a recent press event at a recent press event, describing the characters in A Quiet Place. Blunt and her real-life spouse John Krasinsk, star as Evelyn and Lee Abbott. They’re two parents struggling to protect and nurture a family while a monster-filled armageddon happens all around them. Spoilers follow for A Quiet Place. 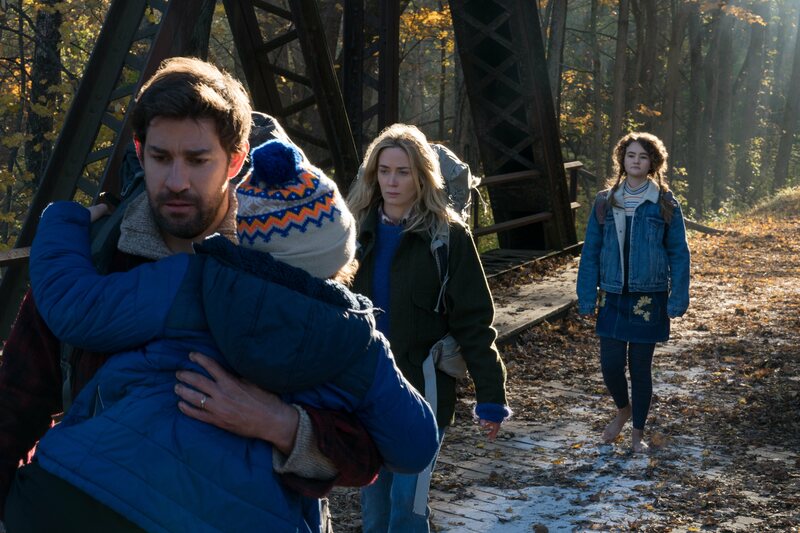 Lee Abbott (John Krasinski) carries his son Marcus (Noah Jupe) with his wife Evelyn (Emily Blunt) and daughter Regan Abbott (Millicent Simmonds) in the background. On March 23, at a press event in New York City, screenwriters Bryan Woods and Scott Beck joined producers Brad Fuller and Andrew Form, along with actors John Krasinski, Emily Blunt, Noah Jupe, and Millicent Simmonds to talk about the film. They commented on how building the film’s characters and the family dynamic was always just as important, if not more, than crafting its compelling sci-fi universe. 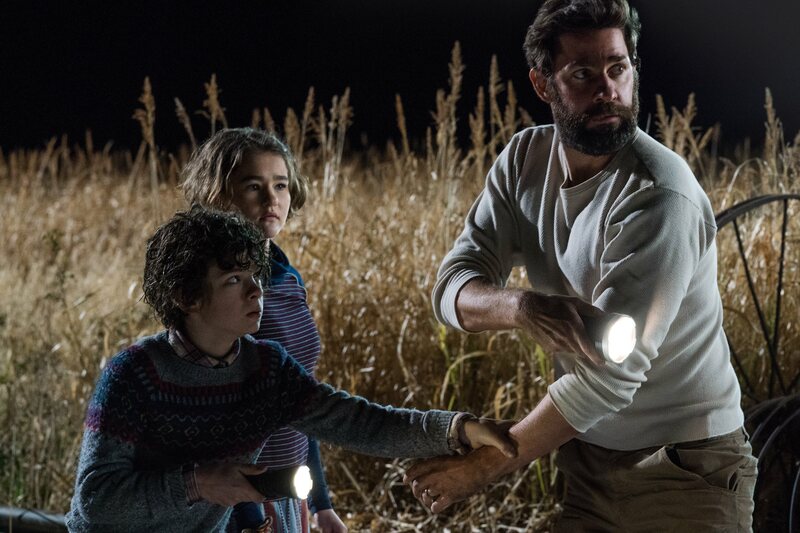 Because A Quiet Place puts family first and showcases these characters and their dynamics — all while they can only use sign language to communicate — the tension builds dynamically, making it the most inventive horror story in recent memory. The “deepest fear” of these parents, Emily Blunt explained at the event, wasn’t so much about self-preservation as it was about providing a thriving life for the children. “Who are we if we can’t protect them?” Blunt’s character whispers during one of the film’s few pieces of verbal dialogue. 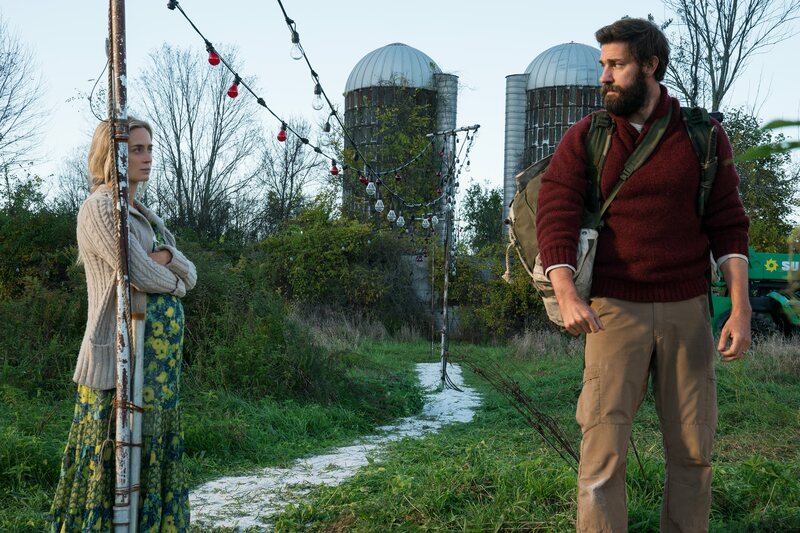 It helps, and shows in the movie, that Krasinski and Blunt are not only married, but they had their second daughter three weeks before starting work on A Quiet Place. Emily Blunt and John Krasinski in 'A Quiet Place'. Blunt calls Lee “an old-school guy … who constantly puts one foot in front of the other … [because] all he wants is to keep these kids alive.” Krasinski added that because of the trauma this family’s been through, his character “just wants to make sure they get their kids to bed every night.” He’s the one that spends the entire film wide-eyed and alert, shushing everyone with a finger on his lips and leaping to put out fires or even sprinting towards danger if it means protecting his kids. “But she says our kids can’t just be survivors,” Krasinski said of his wife’s character in A Quiet Place. “We have to give them an education and a world where they feel welcome and loved. … Our job is to make them better.” Lee obsesses over skills necessary for survival, but it’s Evelyn that teaches their son math and encourages her children in supportive ways beyond fish traps and foraging. 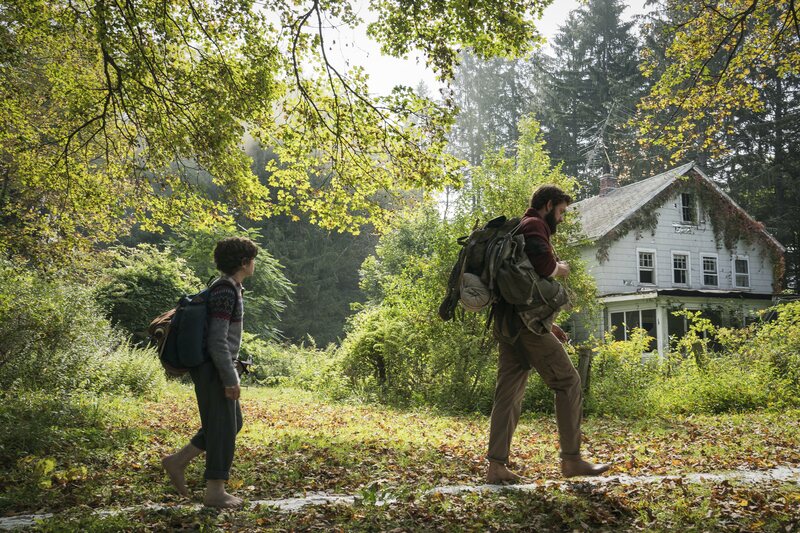 Lee spends a section of 'A Quiet Place' teaching his son survival skills. Traditional weapons simply do not work against these monsters, leaving people like the Abbott family to walk around gingerly on lines of sand in bare feet like fearful hobbits. They’re perhaps at an advantage because their eldest daughter Regan (Millicent Simmonds) was born deaf, and the entire family knew sign language even before the world ended. It also helps they live in the very rural Little Falls, New York. Even then, they still fall victim to devastating loss more than once. 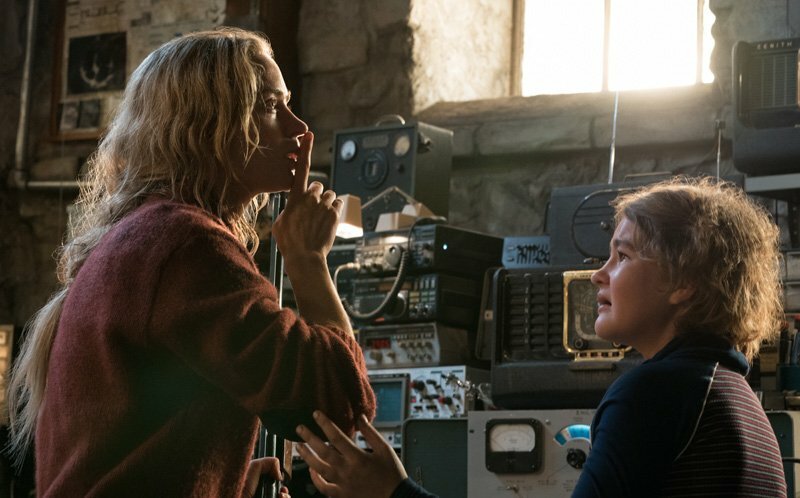 Bryan Woods, one of the film’s initial writers, also talked about “weaponizing sound as a tool of fear” in A Quiet Place. Because the characters deliberately move so quietly, every naturally-occurring sound shocks the viewer. When a character inevitably slips up and makes too much noise, your heart breaks because you know what’s coming next. We check in with the Abbott family three times in A Quiet Place. The first is several months into the apocalypse, the second is more than a year later, and the third is a few weeks after that. Evelyn Abbot (Emily Blunt) in 'A Quiet Place' next to her daughter Regan (Millicent Simmonds). Krasinski drew inspiration from classic horror stories like those from Hitchcock or even Jaws and Alien, and it shows in the building tension. He also cited the Coen Brothers on their use of sound and silence in No Country for Old Men and the same for Paul Thomas Anderson’s There Will Be Blood. The premise and eventual conclusion also owes a lot to Shyamalan’s Signs, but A Quiet Place transcends even that. If the astounding Annihilation hadn’t also come out this year, then A Quiet Place would have zero competition for the year’s best sci-fi thriller. At the very least, it offers a much more accessible and tightly paced thriller that’s bound to have an almost universal appeal. It feels rare that a horror movie would deliver valuable life lessons despite a literally alien premise, but A Quiet Place does just that, while also inspiring hope that Jim from The Office, of all people, might just be one of his generation’s best horror new horror directors.